IN STOCK: 2 Unit Rib Dry Rub combination of Jake's Tri-Tip, Steak and Rib Rub a traditional favorite of the California Central Coast smoked salt, coarse ground pepper, garlic, parsley and hints of fresh herbs provide the perfect blend of seasonings for chicken, ribs, pork, fish, steaks and Tri Tip are All Natural, and contain No MSG. And Jake's Santa Barbara Smoked Seafood Rub a classic blend of Hungarian paprika, smoked kosher salt, hints of cayenne, brown sugar and full flavored garlic make this a wonderful blend for fish, shellfish, slow smoked ribs and more. Country Style Baby Back Ribs, Atlantic and Coho Salmon, Kabobs, New York and Porterhouse Steaks, Tri-Tip, Lamb, Gourmet Chicken and Cornish game hens, Gourmet Blue Cheese Hamburgers, golden french fries, sumptuous Golden Yukon or Idaho baked potatoes wrapped in bacon. Jake's Tri Tip Rib Dry Rub: Paprika, Brown Sugar, Garlic, Parsley, Tarragon, Oregano, Salt, Spices. 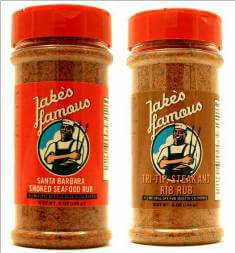 Jake's Santa Barbara Smoke Seafood Rub: New Mexico Chili Powder, Brown Sugar, Pepper, Garlic, Cumin, Spices. Get Jake's Santa Barbara - Tri Tip Steak Combo Sale 2 Pack Today!